GARDEN PARTY MASSACRE wins L.A. Academy of Film Awards for "Best Comedy/Horror" and "Best Ensemble"
Writer/director Gregory Blair's new horror/comedy hits the festival circuit and strikes gold, taking prizes early in the game. HOLLYWOOD, Calif. - July 20, 2017 - PRLog -- Things are looking good for GARDEN PARTY MASSACRE—the highly anticipated horror/comedy feature that mixes murder, mirth and mayhem. Reviews have been glowing, with the film already hailed as "Brilliant", "Hilarious", and "A Comedic Romp" (The Movie Sleuth, Search My Trash Filmsite and Geek Nerdery, respectively). Now GARDEN PARTY MASSACRE has begun its foray into the film festival circuit and the laurels are popping up like dandelions, including two Los Angeles Academy of Film Awards just announced. The film—writer/director Blair's follow-up to his award-winning DEADLY REVISIONS—is a fast-paced, madcap horror/comedy in the vein of Shaun of the Dead and Tucker and Dale vs. Evil involving a friendly backyard gathering that goes hilariously awry when an unexpected guest arrives. With a pickaxe. And an attitude. Its screenplay won "Best Screenplay (unproduced)" at the FANtastic Horror Film Festival prior to going into production. Now that the film is complete, the accolades continue to come. Glowing reviews aside, the film is already an official selection of several festivals around the world and has already won the Los Angeles Academy of Film Awards for "Outstanding Horror/Comedy Feature" and "Outstanding Ensemble in a Feature". Blair is thrilled with all the laurels—literal and figurative. "We're delighted that people are liking the film," Blair says. "It doesn't take itself seriously at all. So many movies nowadays aim to be these weighty, epic experiences and it makes people eager and ready for a lightweight, silly movie they can enjoy without all the pomp and circumstance. GARDEN PARTY MASSACRE is all about just having a good time and I think people are responding to that. I couldn't be more pleased." 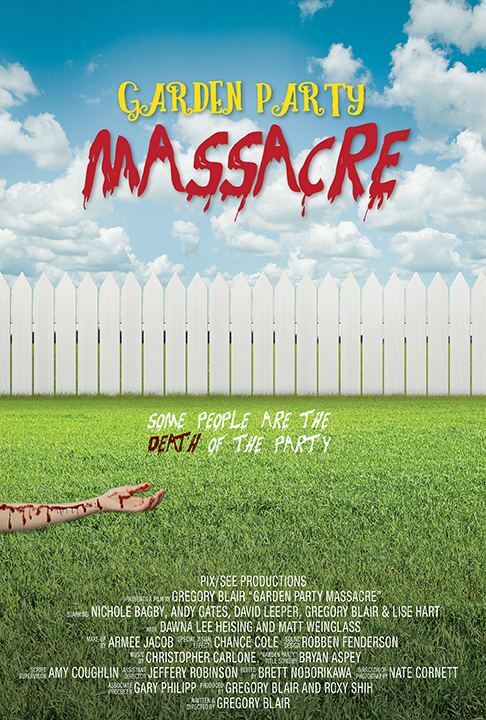 GARDEN PARTY MASSACRE is a PIX/SEE Productions film and its now award-winning cast includes Andy Gates ("Grimm"), Nichole Bagby ("On The Rocks"), Lise Hart ("Deadly Revisions"), Gregory Blair ("Escape The Night"), Dawna Lee Heising ("Samurai Cop2: Deadly Vengeance"), Matt Weinglass ("Jimmy Kimmel Live!") and David Leeper.